Baking and Cooking, A Tale of Two Loves: Chicken Marsala-What To Do with Leftover Marsala Wine! Chicken Marsala-What To Do with Leftover Marsala Wine! We had bought the Marsala wine for my My Husband's Birthday Dinner, We certainly couldn't just let the rest of Marsala wine stay in the wine rack, now could we? Of course, you make the well known Chicken Marsala.We had made it once before, but couldn't find the exact recipe. 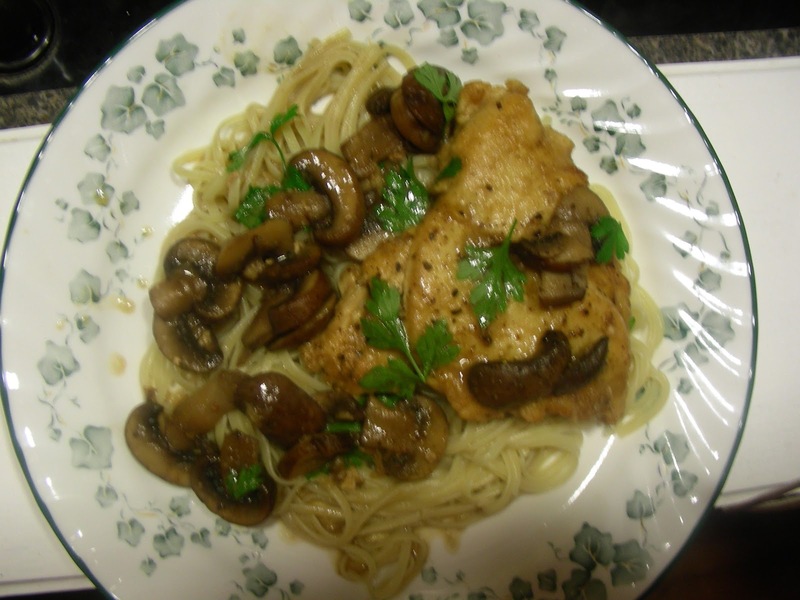 So my Husband found Emeril's recipe for Chicken Marsala, which we adapted. We would use more wine and a touch of tomato paste, if we were making this recipe again.The sauce was good, but there wasn't enough of it. My Husband won't change a recipe the first time that he makes it, except we didn't have any chives, so used parsley. We also used the Cremini mushrooms, Baby Bellas, which are so flavorful. We served this over Linguine, or you could use noodles, also.because this recipe was from Emeril. there is a little"kick" to it, but you could eliminate it you wish. P.S. Remember LIVESTRONG DAY is this Saturday, October 2nd. if you can participate inWinos and Foodies LIVESTRONG WITH A TASTE OF YELLOW-HEART SERIES. Check back on October 2nd for my entry! 1. On a plate or on a bowl, mix flour and Essence. Dredge the pounded thin chicken breasts in flour. 2.Heat oil in a skillet over medium high heat until hot. Add 1 Tbsp. of butter and saute the breasts until they are a golden brown, which is about 3 min, per side. 3. Put the chicken breasts on a plate and set aside. 4. Add 1 Tbsp of the butter to pan and add the mushrooms. Cook the mushrooms until they are brown around the edges, and have given off their liquid. 5. Add the Marsala wine and de-glaze the pan, scraping the brown bits from the bottom of the pan. Cookuntil the wine has reduced by half, and the add chicken stock, and cook until the sauce is partially thickened. 6. Lower heat to medium and return chicken breasts to pan, and cook until they are cooked through and the sauce is thickened. Add additional butter and stir.Optional) if you want lower fat., salt and pepper to taste. 7. Garnish with chopped chives, but we used Italian Parsley. 8. Serve over pasta, noodles or rice. My husband had made this previously for another recipe, so we had it on hand. If you like a little "kick" in you food, add the spice mixture, but personally, I would leave it out next time, but my husband would add it. Looks like a tasty, hearty meal. Sounds great!